A simple dish served on rice, Can be as low fat as you like. Pieces of onion, anything you enjoy and skewer together with the pork. Tiy can then BBQ them, or griddle them. 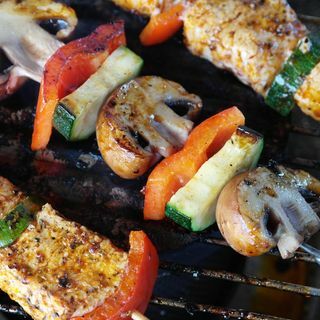 Use the left over marinade to brush over the kebab whilst they cook. Serve with a sauce made fro 3 tablespoons Hoi Sin sauce, 3 tablespoons water and 1 tablespoon soy, heated together in a small pan. Pour over the kebabs and onto a bed of boiled rice. Of course you could serve with pitta and salad!